It is stamped booths Real Old willow on the underside. An antique Booths gravy boat and underplate - silicon china - Made in England. the underplate and boat both have age crazing; the crazing on the underplate is stained. The gilt edges are slightly worn. ~ 30 ~ Booths ~ Floradora ~ Silicon ~ China ~ Plates ~ Platter ~ Gravy ~ Boat ~ 100% To Children's Hospice South West ~. Oval Gravy Boat Dish 20.5 x 14.5 cm Pattern number A8042. Gravy Boat 20 x 7 x 11.5 cm;. Art Deco Booths Ltd Sauce or Gravy Boat decorated in the Montpelier pattern No 3504. Made in Great Britain by Booths Ltd. There is Milk JUg, Gravy Boat & Egg Cup in this sale. Milk Jug 13cm height x 15cm spout to handle. 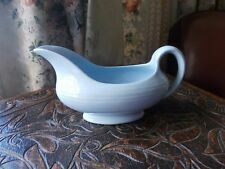 Gravy boat 10cm height x 17cm long. Scalloped with blue willow designed finished with gold trim. Egg cup 6cm height x 5cm wide. FOR THE BASE. 7.4CM ACROSS THE TOP. Booth's FLORADORA. A Gravy Boat and Stand. In very good condition. Complete gold trim. ANTIQUE ITEM. IDEAL FOR THE CHRISTMAS TABLE. A LOVELY OLD PIECE TO DISPLAY OR USE. 1930's Booths Silicon China. (As per pictures). Gravy Boat/Jug. BOOTHS Ltd FOOTED GRAVY BOAT IN WHITE WITH A GOLD AND BLACK PATTERN TO RIMS PATTERN IS FLORAL WITH A TRAILING BUD PATTERN. SLIGHT STAIN ON THE BASE …. NO BIGGIE ….